The official YouTube channel for Atlus has uploaded a new trailer for the upcoming Persona 4: Dancing All Night rhythm game. The trailer focuses on the recently announced DENON headphone collaboration. PSYCHO-PASS Producer Hints at Season 3!? With PSYCHO-PASS: Sentaku Naki Koufuku releasing this month, Dengeki Online did an interview with Mages. producer Asada Makoto and PSYCHO-PASS anime producer Mori Akira. New Crash Bandicoot Game This Fall!? Today, a photo of silhouette that seems to be the game character Crash Bandicoot has been uploaded on imgur. 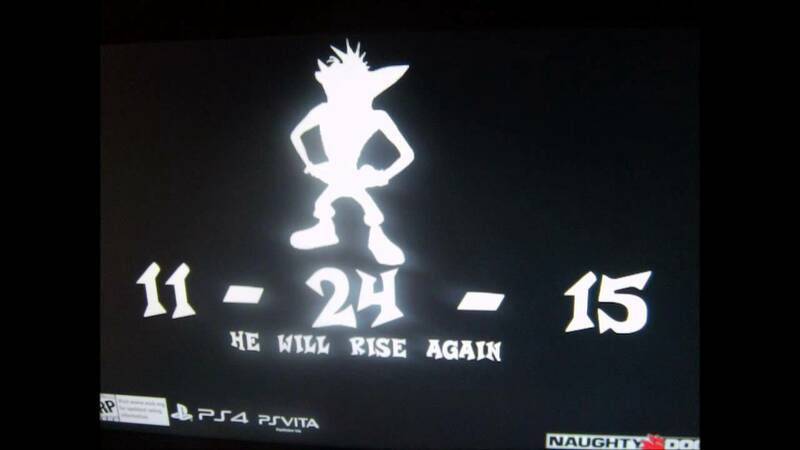 The photo reveals a 11-24-15 release or announcement date, a “He Will Rise Again” statement, the Naughty Dog logo, and the system the game will be on, both Sony PlayStation 4 and PlayStation Vita. However you look at it, that has to be Crash and of course the Naughty Dog logo gives it a huge give away. Idea Factory International has announced that the PC version of Hyperdimension Neptuina Re;Birth 2: Sister’s Generation that was set for a May 19 release has been delayed until June 2.